This is done via the use of our specially designed Just Science notes. The diagrams below show an African elephant and an Asian elephant. 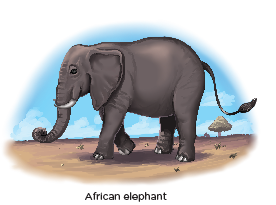 The African elephant has a larger pair of ears than the Asian elephant. (1m) This increases the surface area exposed to the surroundings (½m) and will help to radiate excess heat from the elephant’s body more efficiently (½m) to keep its body cool. 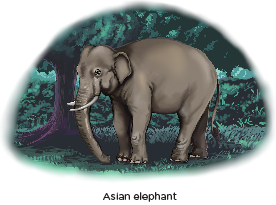 (½m) This is necessary as it lives in the African grassland which has a higher average temperature (½m) than the rainforest where the Asian elephant lives. The lack of hair on the skin of the dolphin decreases the surface area in contact with the water, (½m) reducing friction / water resistance. (½m) Hence, the dolphin will be able to swim faster. Competitive swimmers often put on swim caps and wear full-body swimsuits as shown in the diagram below. A mirage is an optical phenomenon which can occur due to refraction. A man trekking through a desert can sometimes see a mirage which looks like a huge mass of water over the horizon, even though that mass of water does not exist. A desert has air layers of different temperatures. The diagram above shows how a light ray reflected off a cloud can reach the observer. (a) Draw a virtual light ray and mark an ‘X’ at where the observer would perceive the cloud to be. (b) Explain why a mirage would not be seen if light from the sky is reflected off the ground. When the light ray reaches the ground, components of white light from the sky would be absorbed by the ground, reflecting only the colours the person would see the ground as. Hence, total internal reflection must take place above the ground or a mirage would not be observed. A Rube Goldberg machine is a device that intentionally over-complicates a simple task by involving a series of chain reactions. The diagram below shows a Rube Goldberg machine which is tasked to hit the golf ball into the hole. (a) Define ‘force’ and state its SI unit. A force is a push or a pull. The SI unit is newton, N.
(b) Name three forces that are involved in the above Rube Goldberg machine and state if each of them is a contact or non-contact force. (c) A student tried to set up the same device in the diagram, but encountered some problems. In each of the following, suggest a modification which the student can perform on the Rube Goldberg machine to correct these problems. (i) The tennis ball was not projected high enough to enter the bucket. Lower the bucket. Make the slide higher and steeper. (ii) The tennis ball in the bucket was not able to tilt the tilting ramp. Attach the string from tilting ramp closer to the pivot of the see-saw. Shift the pivot of the see-saw slightly to the right. Use a heavier bucket / tennis ball. (iii) The golf club did not hit the golf ball with enough force to move it into the hole. Attach the hinge to a lower position on the golf club. Lubricate the wheels attached to the magnet. (iv) The Rube Goldberg machine generally involves objects moving or rolling on a surface. Explain why it is not recommended for these objects to move over a surface which is too long. 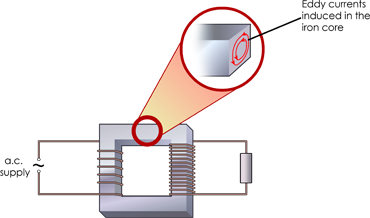 Friction is acting between the object and the surface to oppose the direction of motion. The object would lose more energy due to friction if it is made to move over a long surface and hence cause the system to fail. (a) There are no transformers that are 100 % efficient due to energy loss caused by induced currents in the iron core known as eddy currents. (i) State the effect that eddy currents have in a transformer. It causes the transformer to heat up. (ii) Suggest how energy loss due to eddy currents can be reduced. Use thin sheets of soft iron that is laminated by a layer of insulation. 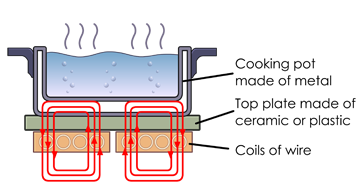 (b) Although eddy current is not desirable in the design of the transformer, it has been used in the induction stoves. Induction stoves work by using coils of copper wire placed under a cooking pot which is connected to an alternating current as shown below. This produces an alternating magnetic field which cuts through the cooking pot. In recent years, induction stoves have been gaining popularity due to the fact that it is much safer than a gas stove. One does not have to worry about getting burnt by the stove during cooking. Even after cooking, the stove remains relatively cool which makes it safe to touch. (i) Explain how the induction stoves is able to heat up the cooking pot. The constant change in the number of magnetic field lines through the cooking pot induces eddy current in it. This causes large amount of thermal energy to be produced, thus heating up the cooking pot. (ii) With the cooking pot on top of the stove, the induction stove is effectively a step-down transformer as the coil of copper wire has many turns and the cooking pot is effectively a single short turn of coil. Explain why the induction stove is designed with a step-down configuration. With a step-down configuration, the voltage in the cooking pot is smaller than in the copper wires. This increases the induced current in the cooking pot. As power loss is greater with higher current, most of the electrical energy would be converted to thermal energy in the cooking pot, allowing faster increase in temperature.